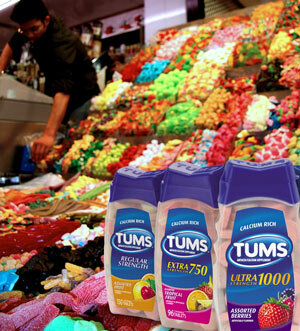 I don’t get heartburn often, but when I do, I eat way more Tums than I need. I can’t help myself. They’re delicious. “Why wait for the heartburn?” I found myself wondering. What if I just ate Tums like candy? It turns out there is good reason not to. They aren’t inherently dangerous, but they do they’re job well. They neutralize stomach acids, which in turn, makes it harder for us to digest food properly. It also makes us more susceptible to food-born pathogens that would typically be killed in our stomachs. So if you find yourself craving fruit flavored chalkboard dust as much as I do, you might want to make sure you’ve mustered up a good belly full of bile before throwing back the antacids.